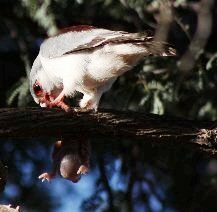 This photo of a Pygmy Falcon feeding on a Sociable Weaver chick is being shared around on Facebook, originating with Kalahari Trails facebook. Visit Kalahari Trails web. "This is most AMAZING photograph, a case of being in the right place at the right time. There have been occasional reports of Pygmy falcons taking chicks out of the Sociable weaver's nest that they live in, but I have only seen it once in 15 years, so it is rather uncommon. Now here we have photographic proof! Well done Andre!!!" Pygmy Falcons have been recorded feeding on Sociable Weaver chicks several times, e.g. A Pygmy Falcon searched nest chambers, until it found a nestling which it ate in the tree; a photo was taken but not published. The author noted that Pygmy Falcons take nestlings when coming across them while looking for a nest chamber to breed in. A Pygmy Falcon emerged with a weaver nestling in its talons, it flew to a nearby acacia tree; a photo was taken but not published. Pygmy Falcons may remove chicks from inside the nest chambers (pers. obs. ), although with markedly lower impact than snake predation.